The perfect complement to wash centers with increased wash and vacuum revenue. 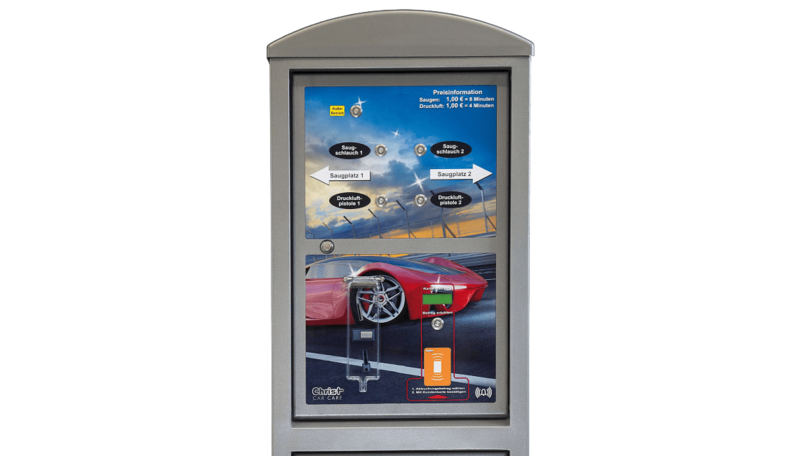 Depending upon the individual operation philosophy, this system can be operated as a supplementary customer offer at charge or as a customer bonus free-of-charge (customer pays for vacuuming in the previously purchased car wash). The amount of vacuum bays and the positioning of the vacuum bays can be selected as required. 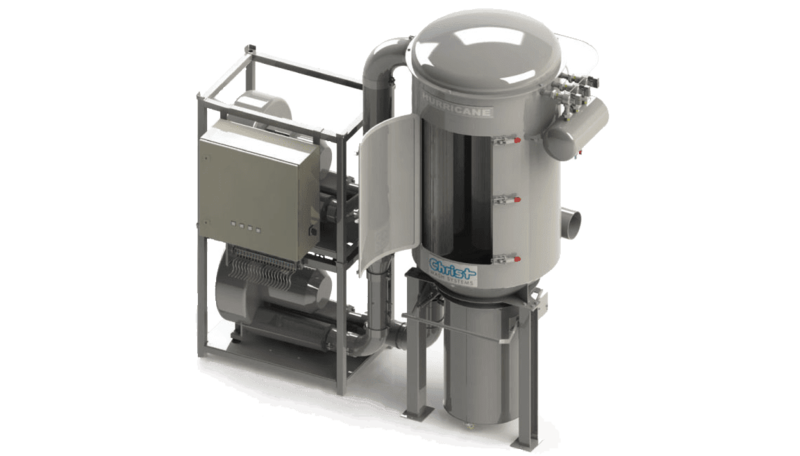 The distance between the vacuum bays and the central vacuum unit is minimized in order to guarantee the best possible vacuum results. 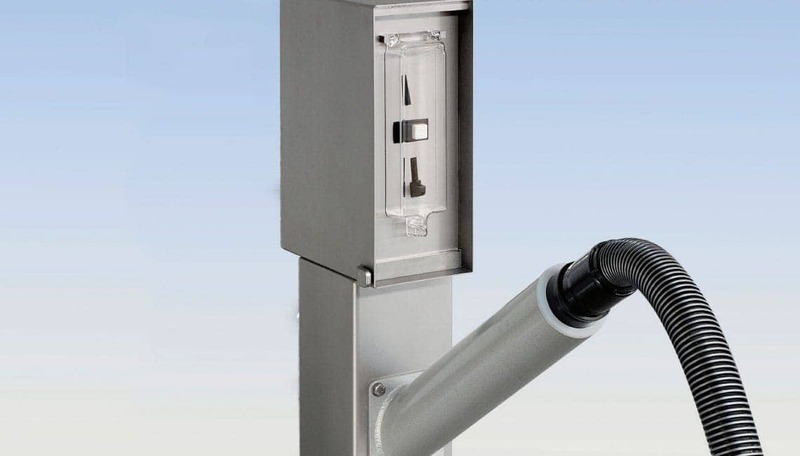 The central suction line can be mounted on either an existing, adequate roof support or on the support columns of a projected roof or alternatively on a free-standing support system from Christ. Vehicles can be vacuumed with unlimited access via the upper hose inlet. The vacuum bays can be planned continuously without ground upturns between the spaces. Vacuum units can also be designed so that each vacuum bay can be equipped with a suction hose for each side of the vehicle. 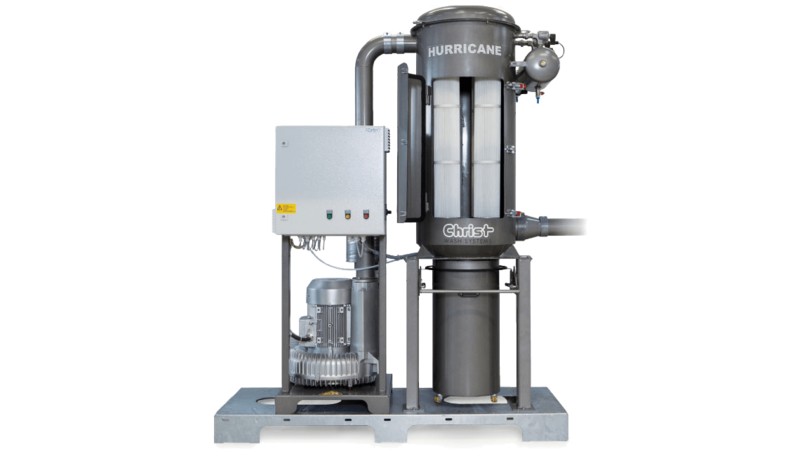 The central vacuum system HURRICANE from Otto Christ AG is the perfect complement to wash centers with increased wash and vacuum demand. 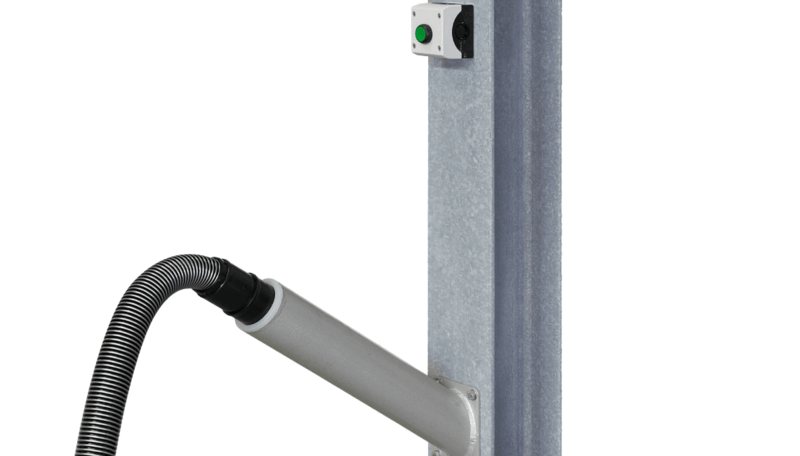 The SOLO version is equipped with a frequency controlled and maintenance-free 12,5 kW side channel blower and is designed for vacuum parks with up to 10 vacuum bays. Four air filters with 8 m² total filter surface are employed for dust removal. The air filter can be removed and cleaned without requiring tools. 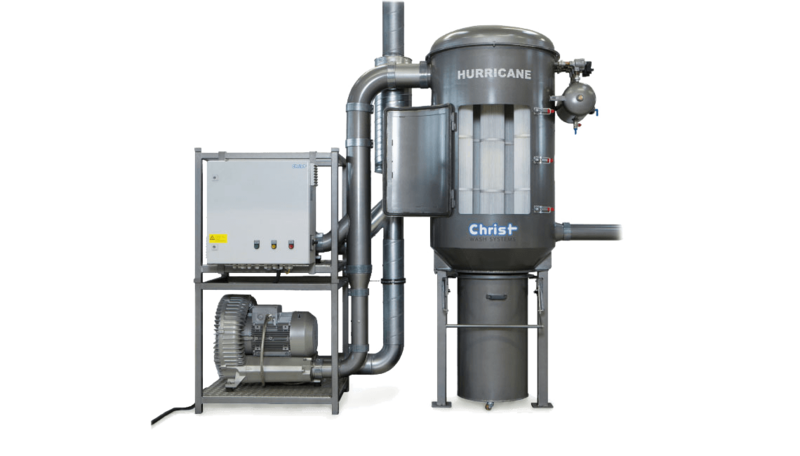 Otto Christ AG offers the HURRICANE as a DUO Version with 2 side channel blowers for larger vacuum operations with more than 10 vacuum bays. The second channel blower is automatically switched on as required. Model variants for 12 to 20 vacuum bays are available. The DUO Version is characterized by a large filter chamber with 7 air filters and a total filter surface of 14 m2. Dirt removal is carried out centrally and service-friendly with the easy-waste-box with rollers, which is capable of holding 100 liters and is easy to move. 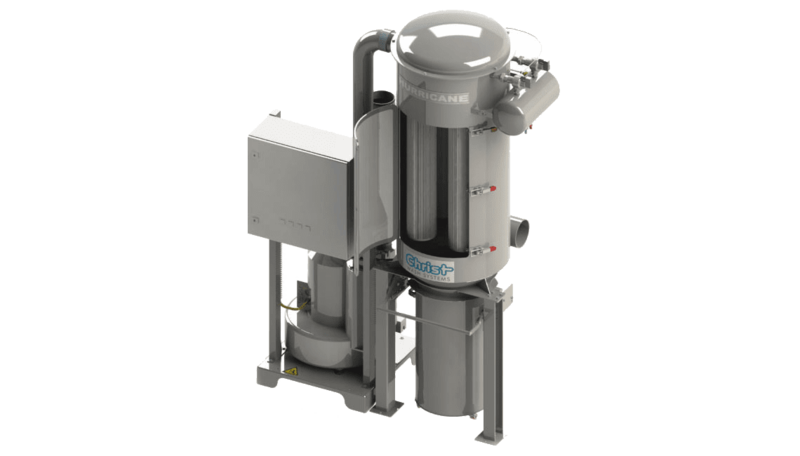 An air-pressure device with a built-on air-pressure chamber is serially provided for supporting filter cleaning. The air-pressure chamber is fed by an air-pressure unit provided by the customer. The vacuum park can be conceived either as a “free-of-charge vacuum park” or as a “pay for vacuum park”. Diverse activation and payment possibilities round-off the product palette. Two container variants and support brackets for mounting the suction pipeline and the suctions hoses are provided for free-standing allocation of the HURRICANE. A principal that enjoys ever-growing popularity by vacuum customers! Unlimited vacuuming “free-ofcharge” is a real customer magnet! In order to cover operation costs, the wash unit operator calculates vacuuming costs in the price of the vehicle wash. Access to the vacuum bays should however be planned so that free vacuuming is not possible without having previously washed the vehicle. The central vacuum unit can also be designed so that it is only possible to vacuum at charge in freely accessible vacuum bays. Only in combination with pinch valve. The pinch valve opens after coin insertion and vacuuming can begin. (Time can be individually set) Can also be combined with a coin suction device in the free-standing version. The passenger vehicle drives in a free vacuum space. Payment succeeds on the centrally installed panel. The corresponding vacuum space is chosen, the pinch valve for this vacuum space opens and vacuuming can begin (time can be individually set). Can be combined with a coin suction device.